Seconds to go before class and I am extremely bothered by the news notifications screaming from the lock screen, becoming harder and harder to ignore by the minute. So bothered, in fact, that I stop staring at them and slam my phone screen-side down on the bench. It makes a tremendous noise but (thankfully) no cracks on the tempered glass. Questioning glances pour in from all directions. Someone is just about to articulate his question when the door creaks open. The professor walks in, embodying an air of seriousness, as classes begin on a disturbingly ordinary note. Life resumes, but the headline on my phone still says, “Trump bans transgenders from U.S. military”. Little do most students realise, or dare to acknowledge, that the international imbroglio strikes much closer home. Earlier this year, Kamla Nehru College’s (KNC) English department organised LitLuminous, its annual literary fest, around the theme “LGBTQ: Literatures Going Beyond The Quotidian”. It turned out to be something of a novelty, what with the outpouring of appreciation and participation from students across the university. An excellent panel of speakers, including Rajorshi Das, Vikramaditya Sahai, Amalina Dave and Divya Dureja, sought to enlighten those present. DU’s LGBTQ student community must have rejoiced. Many students actually left the building realising how important and reassuring it is to have acceptance, no matter what their sexual orientation. I certainly gained a lot of insight from the discussion held in that dimly lit theatre. And if someone wanted to, I believe they could have smashed right out of the proverbial ‘closet’ that afternoon, so to speak. Most of the students and laymen that I have come across, also think of the University of Delhi as a safe haven for diverse communities. “But for a second, also look at how this event turned out to be ‘one of a kind’. I mean, why? If the university was openly receptive, wouldn’t there be more effort? Moreover, the subject is still considered taboo. Hence, you get that kind of overwhelming response. With KNC’s event, there was curiosity. People wanted to ‘know’ about the LGBTQ persons… But at the same time, they considered the event to be ‘bold’. We need to normalise the notion that LGBTQ people exist in DU and all across the country,” a semi-irate closet lesbian, who would like to remain anonymous, texts me her response. Clearly, my complacency will be short-lived. Maybe people do not understand or accept the ground reality yet, not daring to go beyond the notion that members of the LGBTQ community have quirky sartorial choices and an outspoken attitude regarding sexual orientations. Shubham Kaushik, a recent graduate from Miranda House and yet to open up about her orientation to her parents, agreed to shed some light on the issue. While she can see the baby steps heading in the right direction, she laments that this is, at the end of the day, “a country which criminalizes homosexuality.” She points out that there may not be active discrimination in DU, but neither is there an open acceptance. “Disapproval hurts,” she says, recalling that several of her acquaintances have faced harsh criticism as students in DU. In a heartfelt audio note (recorded very kindly, despite a horrid cold threatening to sabotage her voice), she concludes with suggesting that while a ‘pride parade’ may not be the solution, DU’s colleges could certainly do with a set of concrete guidelines on the administrative level, addressing the grievances of students bunched together dismissively in the ‘Other’ category. And it all makes sense. If there can be a ‘Women’s Development Cell’ (WDC) for every college, why not a special cell for the LGBTQ community? It makes me wonder if we, as a collective, are afraid to acknowledge that they are a minority too, in terms of equality. The Hindustan Times reported that not a single student enrolled in the university under the ‘Other’ category recently provided for in the admission forms, in 2015-16. Clearly, this ‘Other’-ing and singling out of individuals cannot be the solution. This was also the national daily which reported that DU’s student elections do not tend to focus on this segment of the population at all, as if the LGBTQ students did not exist. There are no sensitization drives in the campus. When last year a transgender student, Riya Sharma, narrated her tale of campus discrimination, it began to be widely covered by various news portals. “Even the teachers laughed,” she had said, and it quickly became the headline. I could not help but notice that she said this as a student of the School of Open Learning (SOL), where classes are, in any case, held just once a week. What would give a Riya Sharma the confidence to attend any regular DU college, coming to class for five, sometimes even six days in a week? I suggested that the LGBTQ students could come out to help themselves, organising fests and events in a fashion similar to other minorities in DU, like say, the North-East fests. Vineeta Rana, an LGBTQ member and a third-year student herself, concurred. She voted in favour of a Queer Pride Parade in DU, not unlike the one organised by IIT Delhi in the North Campus last October, only much larger in scale and more widely publicised. 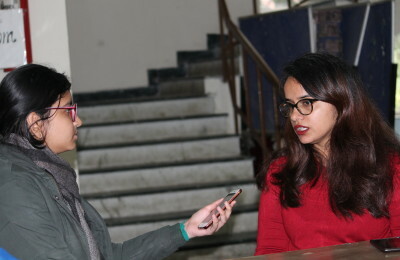 “The Delhi Pride Parade is held in November/December, and I have exams then, so it is difficult to attend,” she says, while opposing the fact that LGBTQ students are discriminated against in DU. On the other hand, I could not be so sure. After having spoken to a number of students, some agreeing to the fact that DU is their safe haven (unlike the outside world) and others not, one thing emerges clearly. Whether or not they would like to openly scream out the truth about their sexuality from the rooftops, all of them are aware of their identity as a minority, owing to the covert discrimination in the eyes of the onlookers. ‘It’s all in the mind,’ as the proverb goes. And the only way to change minds is via active sensitization, something a mere notification on my phone screen cannot achieve.